Off-line water removing device separating the water and capturing contaminants simultaneously. Based on our 2-stage coalescent water removal principle. The units have a plexiglass compartment for a visual check of the water separation progress. The water can easily be drained from the tap. All systems getting contaminated by water on a regular or continuous basis. Clean your oil and save on oil changes. Easy handling and low running costs. The WS-WD water separator is composed of solids filtration, coalescence and separation. A pre-filtration stage will remove solid contaminants as well as it makes water particles aggregate together. The WS Water Separation filter inserted in the WS housing then performs the water droplets to merge into bigger drops. These big water drops separate from the oil by gravity and settle at the bottom. The lower part of WS housing is made of clear acrylic, allowing to observe the water separation at a glance. The drain valve fixed on the WS housing allows manual draining of the separated water. 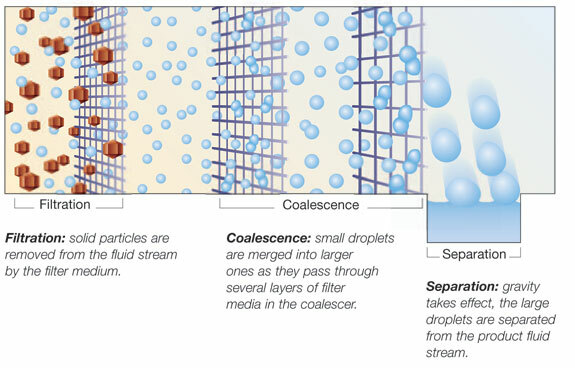 The coalescing technology performs best at low viscosity. Pre-heating the oil might therefore be necessary. For application with emulsified water, we recommend to run a trial first. Some oil types are very hydrophilic and emulsified water can be difficult to separate. Contact a Triple-R representative for further information.